Teresa Rhyne and Seamus the beagle had both survived cancer once, so when Seamus develops yet another cancer, Teresa is devastated. She embarks on a massive lifestyle shift embracing a more animal-friendly approach and trying to find her place somewhere between a hippie in a hemp skirt and a hypocrite in leather high heels. 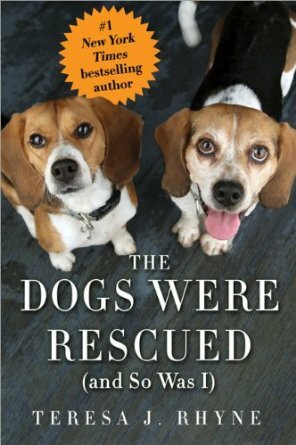 And then she realizes that Seamus wasn t the only beagle who needed rescuing… Dogs Were Rescued (And So Was I) is the poignant yet hilarious exploration of how you move forward when you ve done everything you can and it s still not enough. Teresa Rhyne is a lawyer, writer, dog lover and breast cancer survivor (though definitely not in that order). She loves wine, books, coffee and dogs (still not in order) and loathes exercise, Christmas, and chocolate (probably in that order). She has lived in Southern California (it’s like its own state) for her entire life but only recently has she lived in any one house longer than five years. She shares said house with her boyfriend Chris and their irrepressible, diabolically cute beagles.